In Girl Scouts, girls discover the fun, friendship, and power of girls together. Through a myriad of enriching experiences, such as extraordinary field trips, sports skill-building clinics, community service projects, cultural exchanges, and environmental stewardship, girls grow courageous and strong. Girl Scouting helps girls develop their full individual potential; relate to others with increasing understanding, skill, and respect; develop values to guide their actions and provide the foundation for sound decision-making; and contribute to the improvement of society through their abilities, leadership skills, and cooperation with others. 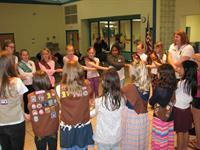 Each year, the Girl Scouts of Minnesota and Wisconsin River Valleys serves nearly 45,000 girls in 49 counties. With the support of almost 18,000 volunteers, we help girls discover new abilities, connect with friends, and take action to improve their communities. Girls of all abilities in kindergarten through 12th grade are welcome. Adult volunteers are welcome too. Join us!